Mustard greens are very popular in China for stir-fry, and mostly used cooked. 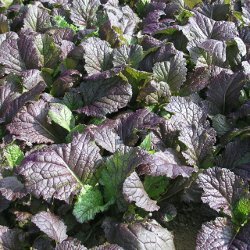 The oriental mustards are a very large group of rather coarse-leaved brassicas, usually having a spicy flavour. The main advantage for the gardener is that they are very robust, tolerating a wide range of soil types, and most are exceptionally hardy. Slower growing than many oriental greens, they are less suitable for cut and come again seedlings. Sow in modules or direct from July to the end of August, spacing plants 30cm (12") each way. Although hardy enough to withstand most winters outdoors, crops planted under cover in September will produce a high quality, more tender crop from winter to spring. Plants will also grow larger under cover, so increase spacing to about 37cm (15").